(left to right): Republican Peter Flores and Democrats Pete Gallego and Roland Gutierrez, three of the eight candidates vying for state Senate District 19. Long before the seat opened up in Texas Senate District 19, State Rep. Roland Gutierrez was traveling the massive district, making friends as far west as Big Bend National Park’s Brewster County in anticipation of the fate that would ultimately meet the embattled incumbent, Carlos Uresti. Late Thursday morning, though, Gutierrez found himself much closer to home, knocking on doors in the heart of his House district on San Antonio’s Southeast Side, where he encountered a number of familiar faces. He reminded them he has represented them for 13 years – three as their City Council member, 10 as their state representative. Complicating the dynamic between Gallego and Gutierrez is a growing Republican effort to unify behind a single candidate – Pete Flores, who ran against Uresti in 2016 – and send him to a runoff in the Democratic-leaning district. That movement became clearer than ever Thursday when Lt. Gov. Dan Patrick jumped into the fray, endorsing Flores over his two lesser-known GOP rivals. 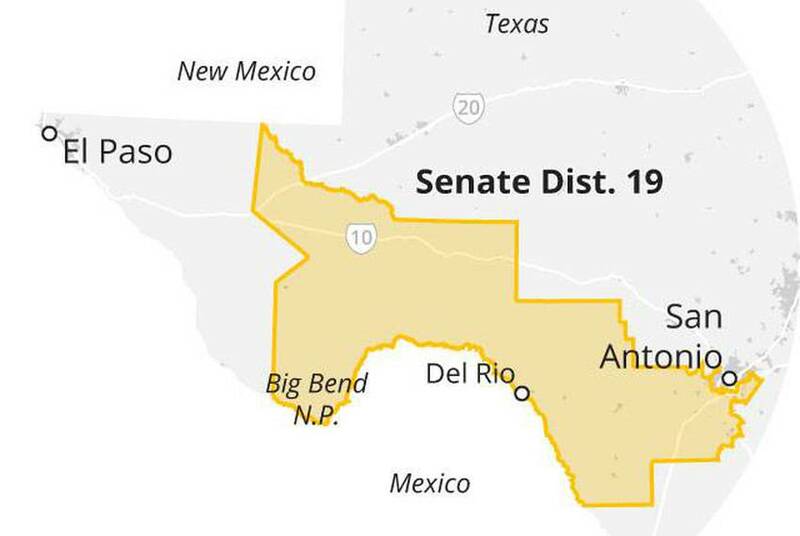 The clock is ticking – and there was never much time to begin with in Senate District 19, which includes San Antonio’s East Side and sprawls hundreds of miles west, covering 17 counties. Uresti resigned June 18, Gov. Greg Abbott announced the special election June 20 and the filing deadline was June 25. Early voting started July 16 and ended Friday. The sequence of events hasn’t left much time for lower-profile contenders to introduce themselves to voters through all the conventional means in campaigns, especially in a mid-summer special election where turnout is expected to be very low. The TV ad is just one of a plethora of salvos that Gutierrez has sent Gallego’s way in the home stretch, pressing him over campaign donations he received in Congress from a private prison group, questioning how committed he is to some liberal priorities such as gun control, and pouncing on recent reports that cast doubt on whether he lives in the district. The bottom line, according to Gutierrez: Despite the verbiage on his yard signs, you can’t trust Pete. Gallego has largely held his fire in response to the barrage from Gutierrez, suggesting to supporters in a recent email that engaging his opponent would be like wrestling a pig. In the interview, Gallego said he took the attacks as evidence he is being viewed as the biggest threat in the race and that people are looking past them because they know him better than what Gutierrez is claiming. “I certainly don’t feel like I’ve been hit by a quarter-million dollars,” Gallego added. To be sure, Gutierrez has also felt the heat in the race. Two days before the filing deadline, the San Antonio Express-News reported that the state lawmaker had been “slapped with multiple federal and state tax liens, two breach-of-contract lawsuits and four tax forfeitures by the state of Texas.” Gutierrez said he was working to resolve some of the issues and that others were due to paperwork errors, while Gallego issued a statement saying he was “disappointed” to learn Gutierrez was not living up to the high standard to which elected officials should be held. There are two other Democrats in the special election: Poteet attorney Charlie Urbina Jones and State Rep. Tomas Uresti of San Antonio, the brother of the former state senator. Uresti, who lost his House re-election bid in the March primary, filed for the Senate District 19 race at the last minute and does not appear to be running as serious of a campaign as Gallego or Gutierrez – though he is at least aware of the challenge his last name creates. The specter of the scandal-scarred Uresti factors prominently into radio and TV ads being run by Flores, which suggest the Democrats vying to replace Carlos Uresti have their own baggage and are not all that different from the disgraced ex-state senator. Flores’ campaign believes the Democratic field is fractured and damaged enough for him to break through Tuesday and prove a competitive runoff contender in a district where Abbott and Democratic opponent Wendy Davis basically tied in 2014. For the GOP, the value of seat is enticing. Control of it would give Patrick a two-thirds majority in the upper chamber, giving him more breathing room on controversial issues and strengthening the Republicans’ hand heading into the 2020 redistricting process. But first Flores has to get to the runoff and past two other GOP candidates, Jesse “Jay” Alaniz and Carlos Antonio Raymond. To do so, he’s been steadily collecting endorsements from officials and groups across the GOP, culminating Thursday with the backing of U.S. Sen. John Cornyn in addition to Patrick, whose campaign also said it was running a digital ad campaign for Flores. The eighth candidate in the race is Libertarian Tony Valdivia, a senior reporting analyst at USAA Bank. Tomas Uresti is another Uresti bitten by the power bug that comes with political office. My advice to him is to go get a job outside of politics. Whoever wins will not be able to impact the far right leaning Texas legislature. Tony Valdivia illegally robocalled people without accurately disclose the message as paid political advertisement. Crickets when it comes to reporting on that. Some “independent” news organization you guys are.